Sharp-tongued Brit critic "Yahtzee" Croshaw talks about his upcoming MMORPG-themed novel Mogworld: The journey from game maker to novelist, what comics he wants to see become games, and what he wants to change in games forever. Internet denizens know Yahtzee best as the caustic-mouthed reviewer who tears games apart with a good tongue-lashing in the popular Zero Punctuation video series, but back in October we were proud to announce that the man himself had signed a deal with Dark Horse to publish Mogworld, a game set inside the universe of a fictional MMORPG. Speaking with ComicsAlliance, Croshaw talked about where the book's influences had come from: a dalliance with World of Warcraft. I played World of Warcraft for a few months a couple of years back, and I remember being quite intrigued by the way the world was absolutely full of backstory -- it having followed on from all the Warcraft strategy games, after all -- but no more story could be created because of the MMO format. You kill a monster, complete a quest, pick a herb, and it all comes right back for the next guy. On top of that, time is frozen; no one ages or gets born, and nothing ever really changes. So I got to thinking: What would it be like to live in a place like that? Would a Warcraft character remember a time back in the RTS [real-time strategy] days when things weren't like this? Would they suspect a conspiracy? And when they die, and they saw those weird angel things that bring you back to life, would they think they were in on it? 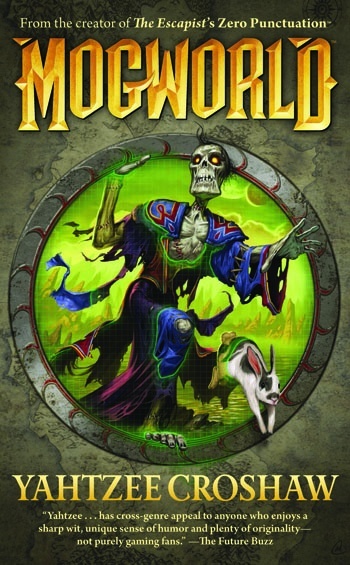 Jim, the protagonist - who is wrenched back to life by a renegade necromancer sixty years after his death - is a NPC in this world, elaborated Yahtzee, and so part of the humor in the book comes from the narrator (and reader) "seeing odd behavior that the reader recognizes as game-related." We may say "LF4M ICC10, need DPS" and know exactly what we're doing by blowing all of our gold on armor and repairs, but someone without that knowledge would see all of our avatars as crazy, no? The fit with Dark Horse publishing is only natural, muses Yahtzee, given the overlap between gamer geek culture and comic geek culture, possibly "because games and comics are both highly visual media, or because gamers and comic readers are both generally seen as huge nerds." If given the chance to work further with Dark Horse following Mogworld - to transform a game into a comic - the Brit with the Sweet Hat said he'd like to do Prototype, just to make fun of the bizarre double standard between gameplay and story: "I'd write a comic about a determined, heroic-sounding man who talks about finding justice for the people who wronged him, and who then runs outside and piledrives an old lady fifty storeys into concrete. Then eats her." But beyond being a critic and author, Yahtzee is a gamer - and when asked what he wanted to see vanish from gaming forever, said surprisingly that it was not the dreaded Quick Time Event nor the brown graphics filter, but crappy writing. "I'd like to make it mandatory for current-gen games to hire a writer. Like, a real one, not just a programmer who joined a poetry circle last week. You'd think with the team sizes and massive amounts of money getting thrown around on big game projects these days, they could bring in at least one person who knows what decent dialogue sounds like." Even games that Yahtzee praised quite highly - like Batman: Arkham Asylum - are guilty of this, and it's something he'd like to change if he had the power.